French press coffee makers are among the most popular types of coffee makers in the world as they are cheap to buy and easy to use. As they are not mechanical, there are no moving parts to go wrong and you don’t have to plug them in to make them work. 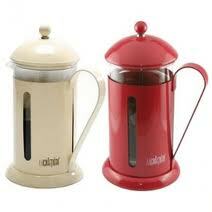 French press coffee pots are sold in most major supermarkets, online stores and large department stores. You can also make just a little coffee for one person, or larger quantities for more people without any difficulty. Great coffee can be made in a French press pot, but what is the best way to do it? What sort of coffee should be used? You can either grind your own coffee using a burr grinder for use in your pot, or take the easy option and buy ready ground coffee in the stores. Coffee for use in a French press pot should be a little more coarse than ground coffee for a drip brewing machine, so take care to buy a product that is labeled as appropriate for use in a French press or that you grind your own to the right consistency. The choice of beans and strength of the coffee will depend on your personal taste. Firstly, put the kettle on to boil and check that your French press is clean and ready to use. Once the water has boiled, leave it to stand for around a minute so that you are using very hot, but not boiling water to make your coffee. While the water is cooling, get your packet of ground coffee or beans that you have ground yourself and measure it into the bottom of the glass part of the French press pot. Exact strength will be dependent on taste, but as a rule of thumb, use a rounded tablespoon of coffee grounds for each cup of coffee you are making. Once you have put the coffee into the bottom of the pot, pour the water on top and place the lid on top of the press pot. Do not push the plunger down. The coffee needs to stand in the hot water for between one and two minutes. Once this time has passed, gently press down the plunger, which separates all of the grounds to the bottom of the pot and leaves the brewed coffee ready to pour off and enjoy. After you’ve finished your delicious coffee, take a few seconds to clean the pot, ready to use next time. Tip the grounds away, and wash all parts of the coffee pot in warm soapy water to ensure that the next time you want a fresh coffee, the pot is ready to go.